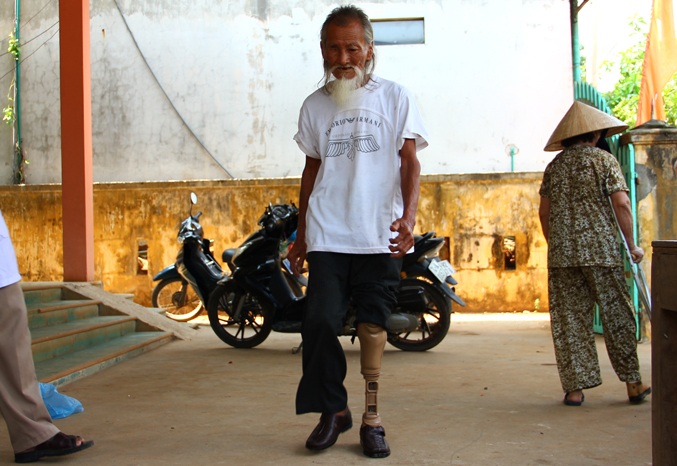 Gio Linh, Quang Tri, 03 December 2015 – In mid-November, Pham Quang Hai, a 75-year-old amputee in Gio Phong Commune, heard the announcement that a Project RENEW mobile outreach team would be coming to his area, with technicians who could provide prosthetic limbs to amputees. Hai wondered if he might be eligible. In 1985 as he and other villagers were reclaiming land for farming, Hai stepped on a landmine. His badly mangled left leg had to be amputated below the knee. Eventually Hai received an artificial leg, a prosthetic device that he had used for the past eight years. But now the device was old and had deteriorated, it no longer functioned properly and it caused pain to Hai’s leg. 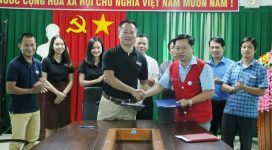 So when Hai heard the news that RENEW’s Prosthetics and Orthotics Outreach Team was coming to the Gio Linh Medical Center, he signed up for an examination. As a victim of the war, he was eligible for the free service provided by Project RENEW. Hai’s amputated leg was examined by RENEW’s P&O specialists, who carefully measured and made a plaster cast of his stump. They promised to notify him within 10 days to two weeks of their return visit to Gio Linh for the next stage in the process, which occurred less than two weeks later. The technicians returned with Hai’s custom-made prosthetic device, they fitted the new leg, noted pressure points and areas of discomfort needing adjustment, and informed Hai that after modifications they would return again for a final fitting. Another beneficiary of the P&O Program, Nguyen Thuc Sinh, also fitted for a new prosthetic limb, was born in 1959. Like Hai, Sinh had the misfortune of detonating a landmine while reclaiming land for farming. In 1992 he stepped on a US-manufactured M16 bounding mine, also known as a “Bouncing Betty” by American Gis. The accident claimed Sinh’s left arm and left leg. The field in which he had been working, Doc Mieu, was once one of the fiercest combat areas of the Vietnam War and was littered with unexploded ordnance. Sinh received one prosthesis over 15 years ago, but by now the device was in very bad condition and caused him much pain and discomfort. The limb had deteriorated so much that Sinh had to use thick string to tie the prosthesis above his kneecap. Since he has only one hand, he had to use his teeth to pull the string tight. The P&O team’s second visit to the Gio Linh medical center was the next stage in the process, for initial fitting of the prostheses that had been custom made for them from the plaster casts. Hai and Sinh put on their new limbs, correctly fastened them and stood up to test their fit, comfort, and functionality. P&O specialists watched, and made small adjustments as they listened to the men describe the fit and the physical sensation, and whether they felt any discomfort. Both men were pleased with their new limbs, so the P&O specialists returned to Da Nang to make final alterations and refinements of the devices in the workshop. 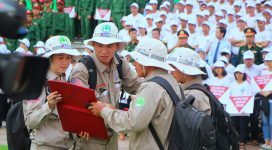 Finally on 2 Dec 2015, the P&O team returned to Gio Linh for the last step, turnover of the new prostheses to Sinh, Hai, and all the other UXO survivors being served. The new limbs were put on and adjusted for perfect fit and comfort, and Hai and Sinh started their regimen of gait training and strengthening their stumps so they could gain strength and soon learn to walk with ease. Such artificial limbs are vital to making survivors’ lives better. They provide amputees with the means to be independent and mobile, to reintegrate into society. The P&O team’s professionalism and commitment to quality, demonstrated through the three stages of the process which take two or three weeks and multiple site visits, helps explains why local people are so appreciative of this humanitarian effort and the Vietnamese staff who run it. Since 2008, over 1,000 amputees in Quang Tri Province have been fitted with prostheses by Project RENEW’s P&O Outreach program. Another 1,100 are still in need of devices. According to Mr. Dang Quang Toan, Project RENEW’s Victim Assistance Manager, most persons with disabilities are poor, so they are unable to afford the cost of prosthetic limbs. “ Our team has met many amputees who showed up without a proper prosthesis made, so they arrived wearing crude, ill-fitting homemade limbs of wood or bamboo,” said Toan. Limbs also must be replaced. Adult survivors ideally should be fitted with a new prosthetic limb every three years, because of changes in shape and size of amputees’ stumps, and normal wear and tear that results in deterioration of every prosthesis. For children, a new prosthetic limb usually must be provided every year since children grow so quickly. Funded initially by the U.S. Department of State and later by the government of Norway, RENEW’s P&O Outreach Program is now being funded by American veterans and private donors. 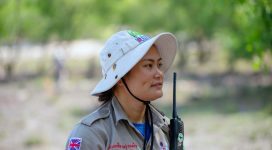 In 2015, when U.S. DoS focused dramatically increased funding on RENEW’s efforts to survey and remove UXO in Quang Tri Province, the P&O outreach program was sustained thanks to private donations from an informal donor group called “Friends of RENEW”. David Wells, a Vietnam veteran and retired lawyer living in London, and the California-based Chino Cienega Foundation have made generous contributions to keep the P&O efforts going without interruption. This year so far 131 UXO survivors and other disabled persons have been provided with new and replacement prostheses. In addition, two P&O technicians from Quang Tri are now attending a one-year training course in Hanoi, which will enable the local hospital to maintain a long-term P&O service in the province. Meanwhile, Project RENEW continues to seek funding from concerned individuals and institutions. Thanks to these generous donations from Friends of RENEW, U.S. veterans, and other Americans of good will, survivors like Sinh and Hai receive the prostheses they need to live better lives – independent, mobile, and more self-sufficient.